The EU is “ready to improve” its offer on the Irish border, Michel Barnier has said as he warned the “moment of truth” was nearing for Brexit negotiations. The EU’s negotiator said he wanted to “de-dramatise” the issue of physical checks and ensure goods arriving in Northern Ireland from the rest of the UK were processed away from the border. He also said any backstop solution must respect the UK’s territorial integrity. It comes as Theresa May prepares to win support for her plans from EU leaders. The UK prime minister will use a dinner in Salzburg on Wednesday to sell her Chequers plan for future co-operation with the EU to the bloc’s 27 other leaders. Michel Barnier said that EU and British officials could work together to come up with locations to carry out technical checks of goods coming from the UK to Northern Ireland, on sites away from ports and airports. Privately EU officials say those checks could be carried out by British or EU officials, or by health inspectors rather than customs officials, which they claim would “de-dramatise” the border issue. As for a new improved proposal? That’s how the EU wants it to be seen, helping the British prime minister at a time of great need. But that’s not the kind of compromise Theresa May is looking for. British officials have already described it as an ” unacceptable” and a threat to the constitutional integrity of the UK. It’s unlikely to loosen the deadlock at the Salzburg summit. Though Mr Barnier is already looking past that, describing the next EU leaders meeting in Brussels in October as the “moment of truth” for Brexit. “They want a Brexit deal this Autumn, so with words and with gestures they’ll try to help her. But this is still not about compromising their principles or red lines,” she said. There is just over six months to go before the UK is due to leave the EU on 29 March 2019. 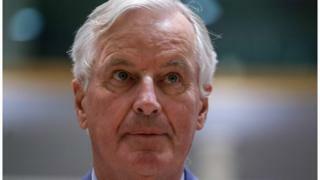 Speaking on Tuesday, Mr Barnier said the talks were in the “home straight” but there were still significant areas of disagreement – such as on the role of the European Court of Justice in enforcing the withdrawal agreement and intellectual property issues, including geographical protections for food and drink. Has the EU shifted position on Ireland? That remains to be seen although the tone certainly seems to have changed. The EU is still insisting on its own “legally operationally backstop” – what it describes as an insurance policy to prevent the return of physical infrastructure on the border in the event no other solution can be found. But Mr Barnier is now saying he is “ready to improve” his initial proposals to address UK concerns and, in his words, de-dramatise the issue. In February, Brussels put forward plans which would see Northern Ireland maintaining full regulatory alignment with the EU in key areas, effectively staying in the customs union and single market. The UK insisted this was unacceptable as it would split Northern Ireland off from the rest of the UK. Mr Barnier is now saying that the backstop should focus on a “set of technical checks and controls” and not be about a sea or land border. How is the UK likely to respond? The UK put forward rival backstop proposals in June, which would see the whole of the UK staying in a customs union with the EU after the end of the proposed Brexit transition period in December 2020. Mr Barnier’s latest comments about doing most new checks away from the border are likely to be welcomed by Tory Brexiteers, who don’t like the idea of a backstop and believe that a solution can be found by using “established” technology and “modifying” existing customs arrangements. However, Mr Barnier still refers to additional physical checks being necessary, due to the UK’s decision to leave the single market and the customs union. She told the BBC on Monday “you don’t solve the issue of no hard border by having a hard border 20km inside Ireland”. Can deal be done in time? The UK is hopeful of progress at the two-day gathering in Salzburg – which is an informal meeting to discuss migration and other challenges facing the EU rather than a formal summit. Unconfirmed reports have suggested key figures such as Germany’s Angela Merkel and France’s Emmanuel Macron are keen to reach some form of agreement that can be signed off at an one-off summit in November. Mrs May is resisting domestic pressure to rethink her strategy from Tory MPs who are concerned that it would leave the UK too closely tied to the EU and unable to fully exploit global trading opportunities. The prime minister has insisted her plan – agreed at her country’s residence in July – respects the result of the 2016 Brexit vote while protecting British businesses dependent on trade with the EU. But she needs to convince those who are concerned that the UK’s different proposals for trade in goods and services would undermine and fragment the single market.